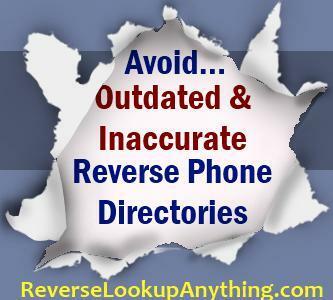 Chicago, IL, USA / ACCESSWIRE / June 19th, 2014 / “There are dozens of online reverse cell phone lookup services. However, the majority of them are outdated, erroneous and expensive” says Will Madison, the author of the TOP 2 Cell Phone Directory Comparison. People turn to reverse phone directories for important reasons like (1) to find out who’s behind an unknown number that came up on the caller ID, (2) to find out who their kids are hanging out with, (3) to find out background information about their new date, or even (4) to find out if their spouses are cheating on them. “When the information they’re looking for is that important, it’s critical that he or she is given accurate results. Unfortunately, only a handful of cell phone number lookup directories provide such truthful information” adds Madison. http://ReverseLookupAnything.com/#Top-2-Services was published recently with the aim of guiding consumers away from such directories that do not provide accurate information. It is an important guide for anyone wanting to look up a residential, business or mobile phone number. Unlike fixed line residential and business telephone numbers that are freely available on the WhitePages and yellow pages, cell phone numbers are usually unlisted in the USA and many other countries. Mobile numbers are not published on public phone books to protect the privacy associated with cell phones. This is why there aren’t any T-Mobile or Verizon reverse cell phone lookup directories even though there are plenty of fixed line AT&T phonebooks available. This is the very reason why consumers are left with no option but to access an online database, if they want to find out the name and address of a cell phone owner. In addition to providing detailed reviews of the best cell phone lookup directories, they have published 10 TIPS for Accurate Cell Phone Number Lookup Results. Anyone can use these 10 tips to assess if a particular company is likely to provide reliable results or not. The importance of using a frequently updated database is especially emphasized. This is because some people change their mobile numbers regularly nowadays. To make the situation worse, wireless carriers recycle numbers and give them to new subscribers. “For example, assume John Doe owned the number 805-841-1234 which he ditched when he switched carriers two months ago. The number was picked up by David Smith. Let’s say someone gets a prank call from this number and he or she decides to run a reverse phone lookup with name and address. If the cell phone directory she used was up-to-date, it would correctly give David Smith as the owner of the number. However, if the directory was not updated within the last two months, it would name John Doe as the prankster” explains Madison. This is the very reason why one should only use an accurate cell phone lookup directory. It goes on to describe 10 such tips that are bound to be useful for anyone looking to reverse lookup a phone number. Visit http://reverselookupanything.com/ for more information.